Dee came to me with this old print dating from 1923. 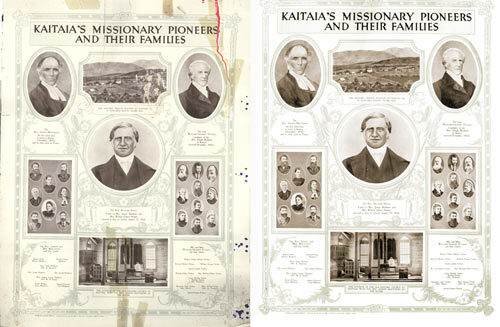 It was an historic document highlighting the missionary pioneers whom settled in Kataia, New Zealand in the early 19th Century. On the top left hand side is Reverend Joseph Matthews. He was the first white man to arrive in Kaitaia in November 1832. He was its pastor for sixty years. Top right is William Gilbert Puckey. He was coadjutor of Rev. Joseph Matthews and arrived later in Nov 1832. Centre is Rev. Richard Davis, he arrived in the Bay Of Islands Aug 15, 1824. Top picture is the historic mission station as it appeared in Kaitaia in 1843. The bottom photo is the old historic church at Kaitaia with the Rev. Joseph Matthews at the altar. The other group photos are the families of Rev. Joseph Matthews and William Puckey. The print was badly torn and stained. Measuring 40 x 52cm it required multiple scans then joining together. I had to painstakingly remove by hand all the stains and tears. Dee was overjoyed with the final results. Thanks Keith, I’ve made contact with the owner of the photo, a copy is on its way! Hi, Rev Joesph Matthews is my relative. May I have a clearer copy of this emailed to me? Would be much appreciated. Cheers Leigh – good to see the family line connection. I’ve sent you an email in reply.